This article originally appeared in the State of Washington Bat Conservation Plan. Further information is available from the Washington Department of Fish and Wildlife. Description. Fringed myotis are small bats, but one of the larger species of Myotis in Washington. Pelage color ranges from yellowish brown to darker olive, with little discernible difference between the back and underparts except in Canada, where the back is pale brown and the undersides are paler (O’Farrell and Studier 1980, van Zyll de Jong 1985, Nagorsen and Brigham 1993). Ears and flight membranes are blackish. The outer edge of the tail membrane is lined with small stiff hairs that are visible to the naked eye, giving this species its common name. Ears are long and extend beyond the nose when pushed forward. The tragus is long and slender. The foot is large, about half the length of the tibia, and the calcar is not keeled. Fringed myotis are one of three physically similar long-eared Myotis species in Washington. Problems can exist in distinguishing this species from western long-eared myotis and Keen’s myotis (Rasheed et al. 1995). However, fringed myotis are usually separable from other species by the conspicuous fringe of hairs along the rear edge of their tail membrane and by their relatively longer forearms and larger ears. Taxonomy. Four subspecies are recognized (Simmons 2005), with two subspecies present in Washington. Myotis t. thysanodes occurs in eastern and perhaps western Washington. 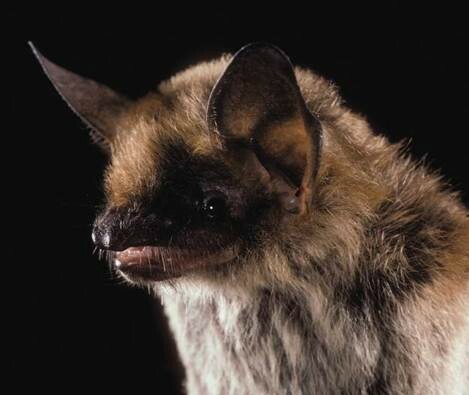 Myotis t. vespertinus has been described from southwestern Washington, western Oregon, and northwestern California (Manning and Jones 1988), but is not considered a valid subspecies by some authorities. Distribution. This species ranges across much of western North America from south-central British Columbia to southern Mexico (Keinath 2004, Nagorsen 2004b; Appendix A). In Washington, fringed myotis occur primarily east of the Cascade crest (WDFW WSDM database). Only a few confirmed records exist for western Washington, these being from Whatcom County (Perkins 1988), Jefferson County (Scheffer 1995, Nagorsen 2004b), Thurston County (WDFW WSDM database), and Skamania County (West et al. 1984). Records of uncertain validity or location exist for Skamania and Clark counties (Johnson and Cassidy 1997), the southwestern Cascades (Thomas 1988), Clallam and Jefferson counties (West et al. 2004), and Kitsap, Jefferson, and Snohomish counties (Ormsbee and Hohmann 2010, Ormsbee 2011). Despite listing the subspecies M. t. vespertinus as present in southwestern Washington, Manning and Jones (1993) provided no documentation of records from there. Population status. Little is known about popula- tion size and trends throughout the range of fringed myotis, including Washington. The species is generally considered uncommon to rare across much of its distribution, but can be locally common (Baker and Lacki 2004, Keinath 2004). In eastern Washington, fringed myotis were relatively common and comprised 13% of total bat captures in pon- derosa pine forest along the east slope of the Cascades in Yakima and Kittitas counties (Baker and Lacki 2004), but were uncommon or absent at other southeastern Cascades sites (Frazier 1997, Taylor 1999). It is one of the most common bats at Moses Coulee (Fleckenstein 2000, Rosier and Rosenberg 2006), but was not detected at Hanford (Gitzen et al. 2002, Lindsey et al. 2012), the Yakima Train- ing Center (Christy et al. 1995), eastern Grant or northwestern Adams counties (Wisniewski et al. 2010), or the Selkirk Mountains (Campbell 1993). The few records from western Washington (West et al. 1984, Perkins 1988, Thomas 1988, Nagorsen 2004b, WDFW WSDM database) suggest that it is rare throughout this region. Habitat. Fringed myotis inhabit a variety of plant communities including desert scrub, dry grasslands, shrub-steppe, drier forest, moist coastal coniferous forest, and riparian forest, but drier woodlands (e.g., oak, pinyon-juniper, and ponderosa pine) are often preferred (O’Farrell and Studier 1980, Nagorsen 2004b, Keinath 2004). Access to water sources appears to be important. This species occurs from sea level to 2,850 m, but is most common at middle elevations from 1,200 to 2,100 m (WBWG 2005). In ponderosa pine forest in eastern Washington, it was more common in a lower elevation watershed (760-1,260 m) than a somewhat higher watershed (1,000-1,400 m) (Baker and Lacki 2004). Other state records come from sites with a mix of riparian vegetation, shrub-steppe, and cliffs (Williams 1968, Fleckenstein 2000, Rosier and Rosenberg 2006); shrub-steppe, ponderosa pine, and cliffs (Sarell and McGuinness 1993); Douglas-fir- western hemlock forest (West et al. 1984, Thomas 1988); and westside forest (Perkins 1988). Males are more common than females at higher elevations in eastern Washington (Baker and Lacki 2004). Roosts and roosting behavior. Day roosts, including maternity colonies, occur in trees, snags, rock crevices, caves, mines, and buildings (O’Farrell and Studier 1973, 1980, Weller and Zabel 2001, Keinath 2004, Nagorsen 2004b, Lacki and Baker 2007). In regions of dry climate, fringed myotis commonly prefer rock crevices as roosts (Rosier and Rosenberg 2006, Lacki and Baker 2007). For example, in ponderosa pine forest along the eastern slope of the Cascades in Washington and Oregon, Lacki and Baker (2007) reported that most reproductive and non-reproductive females roosted in rocky substrates (i.e., outcrops, talus slopes, large boulders, and boulder fields) in predominantly nonforested areas, with far less use of snags, stumps, and downed logs. In other parts of its range, live trees and snags are used exclusively, especially those having larger diameters and heights and in the early to moderate stages of decay with exfoliating bark present (Table 3; Chung-MacCoubrey 1996, Rabe et al. 1998a, Weller and Zabel 2001, Lacki and Baker 2007). Although Lacki and Baker’s (2007) study suggests that tree roosts are less important than those in rocks in parts of eastern Washington, they noted that the three largest roosts, holding 14- 118 bats, occurred in large ponderosa pine snags. Maternity colonies form from about mid-April to September (O’Farrell and Studier 1980, Rasheed et al. 1995). Those in buildings can rarely exceed 1,000 animals (WBWG 2005). In contrast, nursery colonies in trees or rock crevices are much smaller (Nagorsen 2004b). Day roosts with one to seven females (reproductive status not stated) have been reported for Washington (Lacki and Baker 2007). Females sometimes roost in tight clusters (O’Farrell and Studier 1973). Females in trees or rock crevices frequently switch day roosts, using a site for less than two days on average (range = 1-16 days) before moving (Cryan et al. 2001, Weller and Zabel 2001, Lacki and Baker 2007), whereas fidelity to roosts in caves and buildings is much higher (Keinath 2004). Cryan et al. (2001) reported that nursing females changed roosts together while carrying young. Much less is known about the day roosts of males, but Rosier and Rosenberg (2006) found them roosting exclusively in basalt cliffs at Moses Coulee. Males are believed to roost alone or in small groups separate from females during much of the non-hibernation season (O’Farrell and Studier 1980, WBWG 2005). This species is known to use torpor while day roosting (O’Farrell and Studier 1980). Caves, mines, rock crevices, buildings, and bridges are used as night roosts (O’Farrell and Studier 1980, Nagorsen and Brigham 1993, Adam and Hayes 2000). Individuals have been reported night roosting under bridges in Whatcom County (Perkins 1988) and in caves in Skamania County (Perkins 1985). Hibernacula occur in caves, mines and buildings (Perkins et al. 1990, WBWG 2005). Animals have been found hibernating solitarily in Oregon (Perkins et al. 1990). An individual collected beneath a 1.5- m diameter rock in Okanogan County on 30 October (Johnson 1961) was perhaps at a hibernation site. Reproduction. Adult males begin sperm production by late July to early August in preparation for breeding (Baker and Lacki 2004, Lacki and Baker 2007). Mating occurs in the fall after maternity colonies dissolve (O’Farrell and Studier 1973, 1980). Ovulation, fertilization, and implantation are delayed until spring. Pregnancy lasts 50-60 days and is followed by the birth of a single young usually between late June and early July (O’Farrell and Studier 1980, Rasheed et al. 1995, Baker and Lacki 2004, Lacki and Baker 2007). Lactation extends to about early August (Baker and Lacki 2004, Lacki and Baker 2007). Young are placed in clusters separate from adults and become capable of limited flight at 17 days of age and full flight at 21 days of age (O’Farrell and Studier 1973). Young beginning flying by late July or early August (Baker and Lacki 2004, Lacki and Baker 2007). Females may breed in their first autumn, but males apparently wait until their second year. Food habits and foraging. Fringed myotis feed on beetles, moths, flies, leafhoppers, lacewings, crickets, spiders, harvestmen, and other invertebrates (Keinath 2004, WBWG 2005). Presence of flightless insects in the diet indicates that some prey are gleaned from foliage (Nagorsen and Brigham 1993). Analyses of stomach contents indicate that the main prey include moths, arachnids, leaf and plant hoppers, and beetles in western Oregon (Whitaker et al. 1977, Ober and Hayes 2008a) and moths and leafhoppers in eastern Oregon (Whitaker et al. 1981). The slow and highly maneuverable flight of this species is well suited to both aerial capture and gleaning of prey from foliage (van Zyll de Jong 1985). This, together with the type of echolocation call, suggests that fringed myotis are adapted for foraging within forests and along forest edges (WBWG 2005). Foraging peaks one to two hours after sunset (Keinath 2004). Foraging sites averaged 1.6 km from day roosts in ponderosa pine forests in Washington and Oregon (Lacki and Baker 2007). Rosier and Rosenberg (2006) recorded one individual traveling 6.6 km to a foraging site. Seasonal movements. This species appears to migrate in Arizona and New Mexico, but little other information is available on distances traveled, timing, destinations, and whether all populations do so (O’Farrell and Studier 1980, Keinath 2004). Threats. This species is considered sensitive to human disturbance (O’Farrell and Studier 1973), thus roosts are vulnerable to activities such as recreational caving, cave vandalism, and mine exploration (Keinath 2004, Nagorsen 2004b, WBWG 2005). Loss of roosting habitat is another threat and can be caused by closure (i.e., blockage) or renewed activity at abandoned mines, loss of large decadent trees, timber harvest, and replacement of buildings and bridges with structures that lack roosting opportunities for bats. Loss or modification of foraging habitat can result from timber harvest, livestock grazing, and residential and agricultural expansion. Pesticide spraying is an additional concern. Conservation measures. In eastern Washington, managers should work to maintain a diversity of roost structures, including large-diameter ponderosa pine snags and crevices in rocks. Occupation of snags is greater in forests with larger-diameter trees and snags (Lacki and Baker 2007), thus the structural characteristics of the surrounding forest influence roost use and should be part of forest unit management prescriptions. Managers should also maintain the integrity of basalt rock outcrops and talus slopes to protect potential roosts in rock crevices. Proximity of day roosts to foraging and drinking sites should be considered. In dry environments, maintaining day roosts within 2 km of water sources (e.g., ephemeral ponds and pools along creeks) will likely benefit reproductive females (Lacki and Baker 2007). Riparian areas are probably important sites for foraging and drinking in low elevation westside forests and should remain protected (Ober and Hayes 2008a). Bat surveys should be conducted in western Washington to determine abundance, distribution, and subspecific affiliation of the population there. We thank Greg Falxa, Lori Salzer, Ella Rowan, Travis Nelson, Mike Ritter, Nancy Williams, Jon Lucas, Neal Hedges, John Fleckenstein, Laura Ellison, Robert Fischer, Patti Happe, Ellen Myers, Mason Reid, Joan St. Hilaire, Kent Woodruff, John Bassett, Steve West, Greg Green, Derek Stinson, Keith Aubry, and Jason Lowe for providing useful information on various topics during the preparation of the plan. Final peer review comments were kindly provided by Joe Buchanan, Greg Falxa, Ella Rowan, Harriet Allen, Howard Ferguson, Nancy Williams, John Fleckenstein, Ted Weller, Tom Rodhouse, Lori Salzer, John Bassett, Katie Gillies, Greg Green, Lynn Hellbrecht, Doug Kuehn, Cori Lausen, Cole Lindsey, Jon Lucas, Michael MacDonald, Mike Ritter, Travis Nelson, Michelle Tirhi, and Mitch Wainwright. Comments on earlier drafts were received from Joe Buchanan, Paula Call, Greg Falxa, John Fleckenstein, Michael MacDonald, Patti Happe, Sally Nickelson, Pat Ormsbee, Ella Rowan, Jim Schaberl, Dave Waldien, Ted Weller, Steve West, and Ron Wohrle. Lori Salzer and John Talmadge assisted with creating the bat species range maps for Washington. Kelly Cassidy, Charles R. Conner Museum, Washington State University; Gary Shugart, Slater Museum of Natural History, University of Puget Sound; and Philip Myers, Museum of Zoology, University of Michigan, provided records of bat specimens held at their institutions. Bat Conservation International (www.batcon.org) provided (with permission) the color photographs and North American range maps of each bat species used in the species accounts and Appendix A, respectively. Staff at the Washington State Library gave invaluable assistance in obtaining published literature.